Prop your feet up, add a splash of color to your room, and gain some extra storage space by purchasing a foam ottoman cube. Ottomans, typically known as small pieces of furniture upon which you rest your feet while reclining in a chair, can serve multiple roles in your living space. 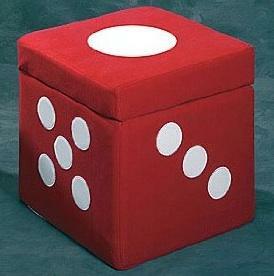 One of the most versatile ottoman types is the foam ottoman cube. The extra foam padding creates a comfortable resting place for your feet and can also function as an extra seat for guests. The cube shape allows for hidden storage space and ottomans provide an opportunity to add color, texture and pattern to your decorating scheme. Ottomans are available in a wide range of fabrics, including fur, microsuede and suede, and tufted and smooth leather, among other types. For those with traditional tastes, elegant patterns or dark leather complement a sophisticated scheme. Microsuede works well with nearly every decor and is available in a range of colors. Bright colors, for example, would be ideal for a kid's room. You likely have several remote controls for your TV and other electronic equipment as well as TV guides, newspapers and magazines or other items that end up crowding your end tables or coffee table. Instead of allowing clutter to build up, why not store them away? Storage ottomans allow you to hide these essential items while still keeping them in a convenient location. You may also store extra blankets, pillows and board games, depending on the size of your cube ottoman. When you have a party, you want to be sure guests have places to sit. For informal events, guests often perch on the fireplace hearth or even sit on the floor. However, if you have a foam ottoman or two, guests can have a comfy seat. Another use for your ottoman is as a coffee table. If your living room is too small for a standard size coffee table, consider adding a stylish tray on top so you have a place to sit drinks or snacks. A simple, cubed ottoman is not so difficult to make yourself. Purchase six, two-inch thick wood boards that are around 16" square. Nail five of them together to form a box that is open at one end. Sand and paint or stain a color of your preference. Drill holes for casters, if desired, and screw them into place. Place a foam square on the sixth piece of wood and wrap with fabric. Secure the foam and fabric by stapling the fabric to the underside of the board. Add blocking inside the cube to allow the lid to sit in place, and then cover with padded lid.